I’ve never hired a bare boat before, what can I expect? Your charter can start and finish on any day of the week except Christmas Day and New Year’s Day. Check-ins and briefings are at 9.00am (unless you have a sleep aboard when the check-in is 4.00 pm). Boats must be returned by 10.00am or later by arrangement. An extensive briefing follows check-in, taking in navigation, anchoring, safety and practical boat handling. On board you will find charts, navigation aids and a cruising guide “100 Magic Miles of the Great Barrier Reef” by David Colfelt. No licence required. To charter a sailing vessel, you will need to have sailing experience and be competent in handling a sailing vessel in most conditions. Alternatively, if you have power boating experience only, then we may have a power vessel to suit and we would recommend this option. Basic Navigation skills, along with anchoring and sail reefing are also minimum requirements. Formal qualifications are not required to charter most of our vessels (excluding the Fountaine Pajot 46 Power cat), although it is highly regarded if you do. What insurance do I need when hiring a bare boat? We request a $600.00 deposit within 7 days of placing your booking. On receipt we will email you a pre-charter kit with our comprehensive operations manual, map of the islands and suggested itinerary with information on the area. Final payment of your charter fees are due 60 days prior to departure and you will receive a reminder email at this time. We do recommend purchasing a copy of the 100 Magic Miles of The Great Barrier Reef to assist you in planning your holiday. Copies can be ordered online at 100 Magic Miles. In the event the Charterer cancels this agreement by notice in writing received by the Operator at reservations@yachtcharters.com.au more than sixty days prior to the Delivery Date, the Deposit will be refunded in full less the Service Fee of $200. If written cancellation is received less than sixty days prior to the Delivery Date, all Charter Fees remain due and payable and will not be waived or refunded UNLESS the Operator is able to obtain an alternative booking for the same Charter Period. So how “bare” is a bareboat? All linens, towels, blankets, pillows, well equipped galley with refrigeration, snorkel gear, hot and cold water, deck shower, electric anchor winch, deck BBQ, 100 Magic Miles cruising guide, navigation equipment, safety gear, wet weather jackets, CD player, DVD & flat screen TV, toilets and showers, inflatable dinghy with outboard. All our vessels have the latest copy of the 100 Magic Miles. If you would like to purchase your own copy please visit their website. Please note: Fishing gear is not supplied on board. Fishing packs can be hired from $12.00 p/day. Queensland Yacht Charters do not provide children’s lifejackets as the Queensland Department of Transport does not recognise approved lifejackets for any young children in your group. If you require children’s lifejackets, we recommend they be hired from Aqua Dive (diveshop) which is located at the marina. Your boating holiday is fully inclusive in the price except for fuel which is a simple “pay as used” basis and applies to all sail and motor boats. Outboard fuel and gas is charged at a flat rate of $6.00 per day and you can expect to pay around $70.00 to $120.00 per day for motor boats & around $20.00 per day for yachts for all other fuel. Whitsunday Provisioning is a local company that has been providing provisions to Whitsunday holiday makers for 30 years. They specialise in pre-designed charter meal packages. These very popular packages have been designed to take the stress out of provisioning for charter. They come in three different price ranges and include absolutely everything you need apart from drinks/alcohol. They also offer ‘easy plan menus’ and even ‘self-select’ products and cater for all dietary requirements and budgets. Soft and alcoholic beverages are also available as well as prepared seafood and other platters – you will find they are a convenient online ‘one stop shop’ for all your requirements! For more information please see our Provisioning page. QYC can now offer you wireless internet access on board your boat in Abell Pt Marina. You will need to log onto Myport http://www.myport.com.au/ and sign in for the package you need. Queensland Yacht Charters is based in Abell Point Marina, Airlie Beach which is easily accessible via Proserpine (Whitsunday Coast) airport and Hamilton Island. Proserpine (Whitsunday Coast) airport is recommended as the most convenient airport. We recommend you arrive the day prior to your charter and overnight in Airlie Beach or take the Sleepaboard option on your vessel if available. We can arrange transfers to our base or accommodation in Airlie Beach (refer Contact us for more info). The traveling time is approximately 30 minutes. We like to start your briefing early on the first day of charter with an aim to having you on the water by lunchtime. If driving, there is parking available in the public (council) car-park at the marina for $8.00 per day. Alternatively, lock up secure storage is available from $145.00 for a 5 night booking. My flight won’t get me there in time for the 9am brief, can I arrive the night before? Arriving late in the day? Then ask our Reservations Team if you can take advantage of our sleepaboard option. We strongly suggest starting your charter with a sleepaboard as this allows you to stow away your gear, do a food shop (if you haven’t used the online services of Whitsunday Provisioning) and allows you to familiarise yourself with the vessel. Your brief will commence the following morning on board the vessel at 8.30am. If you prefer a 8am start then please discuss this when booking your sleepaboard option. Boarding your vessel is from 4PM. The sleepaboard option is not available for charters commencing from Hamilton Island and is on request only, subject to availability. I want to take some lessons before my charter, who do you recommend? Basic boating experience is essential for you to enjoy your holiday and for your safety. While we will give you extensive briefings on arrival, these are not “learn to sail” courses. Going boating without knowing what you’re doing is no different from going scuba diving without being able to swim!! A short course prior to coming to the Whitsundays can teach you all the basics and if you haven’t been boating for a while, a refresher course can just add that extra bit of confidence so you can relax and really enjoy your charter holiday. Can we fish while we are on charter? The Whitsundays form part of the Great Barrier Reef Marine Park. Excellent snorkelling and fishing sites are found throughout the islands. Although fishing equipment is not included in your charter rate, fishing is permitted in appropriately zoned areas and we can arrange, with advance notice the hire of a fishing pack. Spear guns are highly discouraged. Quality snorkelling gear is included on board. Certified divers can hire equipment prior to arrival and can visit www.aquadive.com.au for further information and prices. Please check with reservations before you order your gear as to how much storage there is on board your vessel for dive tanks as you will be limited in how many you can take aboard. The information contained in this webpage is gained from many different sources and is by no means complete and is only to be used as a basic guide. You should do your own research before embarking on your fishing trip as changes to legislation, etc may occur. 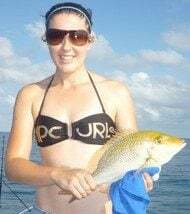 Now, we know all good fisher people love to show off their catches, so we are designing a page specifically for our clients to send their best fishing pictures to us for posting. All you need to do is tell us the date, the vessel you were on and a caption to include. Email them to reservations@yachtcharters.com.au. 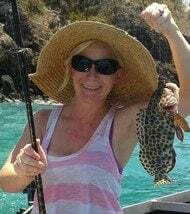 What type of fish can you expect to catch in the Whitsundays? Bluefin and Mackeral are in abundance all year round. They can usually be located by the sight of seabirds skipping over the surface of the water where the tuna are. Casting or trolling around the headlands and in the passages between the islands should also land you a few good tuna for dinner. There is excellent estuary fishing to be found in Gulnare Inlet, Hill Inlet, Nara and Macona inlets. Coral Reef Fishing can provide the likes of Coral Trout, Sweetlip, Emperors, Gropers, Nanygai and many more. Before visiting the Great Barrier Reef Marine Park, it is important you study the zoning map for the area you are visiting to be sure of the activities that you can do and where you can do them. Please visit the website below and click on the zoning map to download a copy. Closed seasons prevent people from fishing at certain times of the year to protect species at vulnerable times in their life cycle, such as during spawning seasons. Throughout the Queensland East Coast, a closed season applies to Barramundi from midday on the 1st November to midday 1st February. The following dates have been implemented as closed seasons for the taking of all coral reef fish. The closures apply to all Queensland East Coast waters between latitude 10°41´S and 24°50´S. The closures are designed to protect spawning aggregations of most Coral Reef Fish Species. 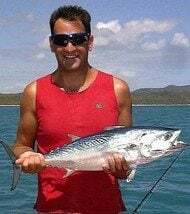 As Queensland Yacht Charters do not supply fishing gear, it is recommended you either bring your own equipment (Generally handlines are the easiest if you just want to dabble). Please order in advance as we may not be able to supply you on the day. When and where can we swim? A common question we are asked at QYC is what areas or what time of the year is safe from marine stingers. Marine stingers do not restrict their movement to any particular area and while stinger season is generally between October to May they can be found all year round. QYC recommend stinger suits are worn whenever entering the water, particularly during stinger season. The thin suits do not need to be pre-booked and are available for hire from $30.00 per suit through the dive shop at the marina. Do you have paddle boards for hire? Are we allowed to go to the outer-reef? A bareboat yacht charter is not permitted to visit the Outer Barrier Reef, but there are many tours on offer to take you out there. Find out more about Protecting the Great Barrier Reef. To visit the outer reef during your charter we can arrange a sea flight on your behalf with Air Whitsunday, for more information and prices call us on our toll free number 1800 075 013 or via email reservations@yachtcharters.com.au. I don’t want to be the skipper, can you provide a sail guide? A sailguide can be hired for a half day for $220.00 or a full time from $350.00 per day. This will assist you in brushing up on your current skills and gain hands on experience for your vessel under guidance. 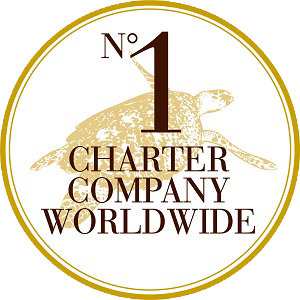 We do provide a high level of support throughout your charter with a pre charter kit sent out once a deposit is paid, comprehensive briefings, 24 hour radio and mobile phone contact and chase boat call outs.